OK – those that know me know that I am not a hockey fan. I just don’t get it. I should be. I live in Washington, D.C. I should be a Caps fan as much as a Nats fan, I’m just, well, …. not. Except if they’re in the playoffs, then it’s exciting, but I still don’t get it! Today – I am proud to report – I think I’m a convert. I didn’t know the Washington Capitals were such big fans of the kids at Children’s National Medical Center! Please join me in making a gift to help Children’s take care of every child who comes through their hospital doors — your donation will go TWICE as far today, up to $25,000. http://bit.ly/L442CM I gave $20, so $40! Pretty cool. 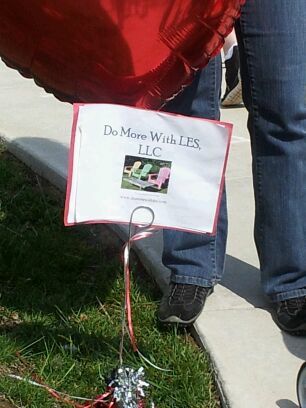 Do More Does First “Yard” Sale! 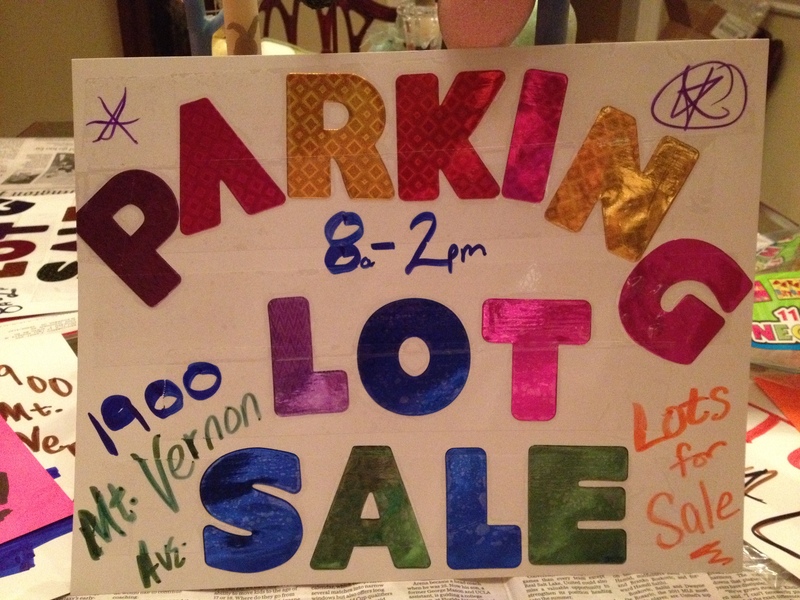 This past Saturday, Do More with LES assisted not one, but two clients by helping to coordinate, arrange, advertise and set up a Parking Lot Sale to sell their miscellaneous stuff. See, they are downsizing, minimizing and best of all… simplifying! The client has a building on “The Avenue” in Del Ray complete with a parking lot, so that’s where the tables got set up, the merchandise displayed and the shoppers shopped! I got a good dose of vitamin D sitting out on the gorgeous Saturday filling the cash box from 8 a.m. – 2 p.m.
We had a good flow of shoppers throughout the day and it went by pretty quickly. In the end, there were many satisfied parking lot sale shoppers who went home with some classic records, fun books, great kitchen wares, framed art, and even a few bookcases, lamps and computer monitors! All in all, just another new specialty for Do More and a fun day and more satisfied clients! 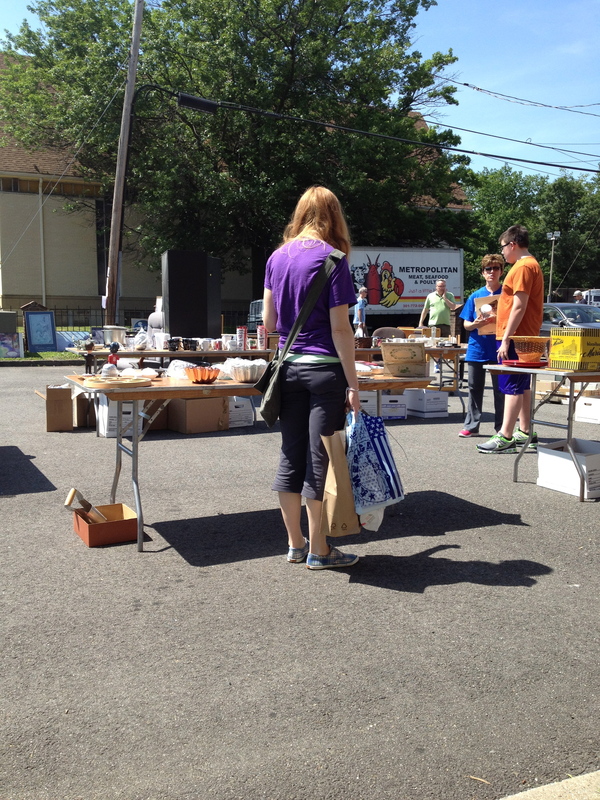 Fun shoppers, bookcases being bought & Ovechkin bobbleheads for sale! 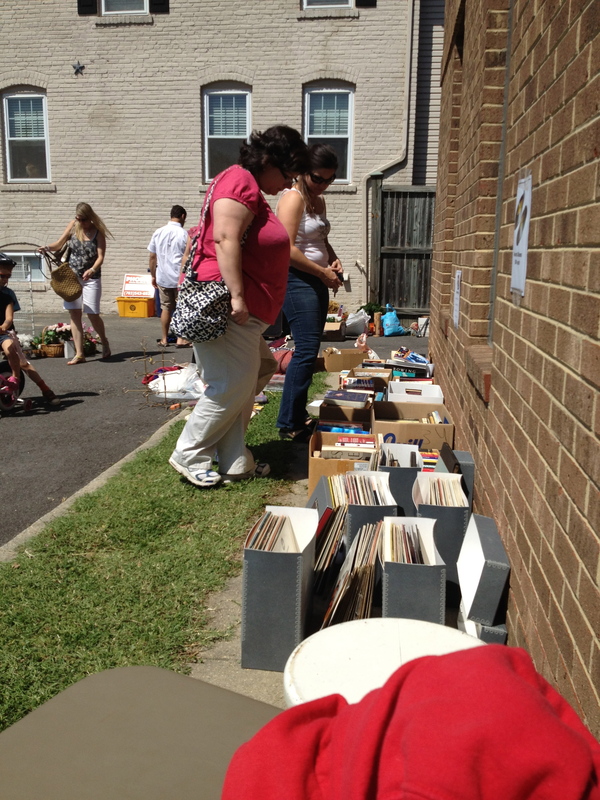 Everyone enjoyed going through the records & books! Very unfortunately, due to personal health reasons, I was unable to participate in the event. Want details and no pictures, visit here & please enter your email. While not heart related, I was hospitalized for a few days prior to the walk. News of my discharge came literally as the walk was stepping off! The good news is this: I have the good fortune of having a mom and dad who have literally been there by my side thru everything (& yes, I mean everything) health and heart related my entire life, so they would not miss the Congenital Heart Walk. Also good news: my fun Aunt Peg & Uncle Johnny came and scooped me from the hospital and took me to their resort on the Chesapeake Bay to recover. 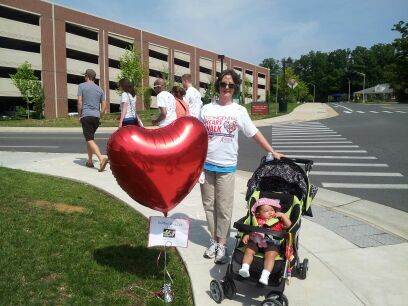 But – back to the walk…Last year a friend notified me right away when she learned during her pregnancy that her unborn baby had a congenital heart defect. With this in common, our friendship has deepened. Her daughter (gender unknown until birth), AGC, has become another of my many “adoptees.” I kept vigil over her at Children’s, sang to her, let her grip my finger in ICU, have watched her grow these first few months of her life. 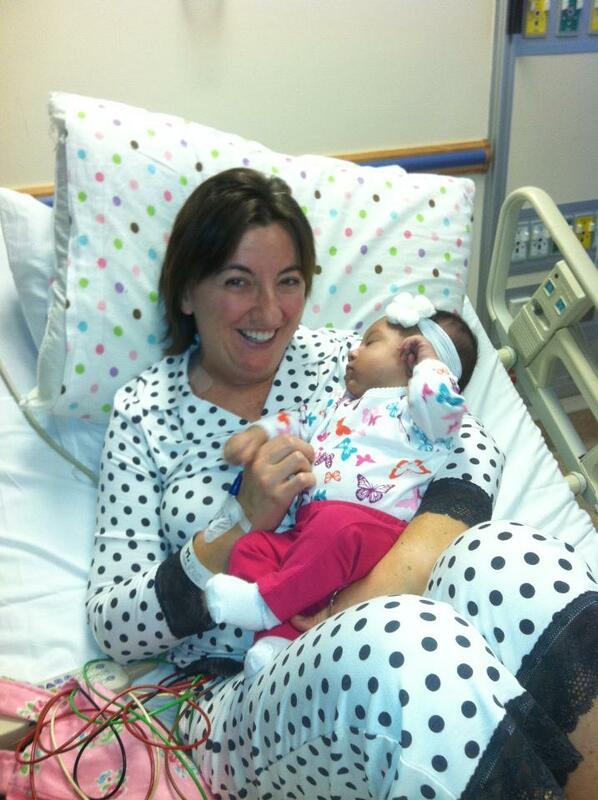 She even visited me when I was at Children’s in October, just a few weeks after she had been discharged. I have loved that little cutie ever since she was born! …Because babies who are born with congenital heart disease (like little AGC) grow up to be adults with congenital heart disease (like me!) and life goes on…heck, this baby even grew up to start her own business, which sponsored the walk this year! My hope is that AGC will grow up and have as much fun with life as I have been so blessed to do. She has a fabulous set of loving parents and siblings just as I do. Here’s to us, AGC … THIS is why we walk!